The dancers seem to flow into one another, interleaving ecstatically to meditative sounds and drawing on the trance dances of Sufi dervishes. The upshot is a series of captivating images of divine bodies. Seeing moves into feeling, everyday life is slowly blotted out as the performance takes us on a journey into ourselves – like the magic mandala, the holy circle of tantric Buddhism which links the viewer with cosmic powers, thereby opening the door to the soul. 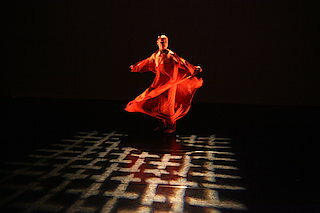 The Borobudur temple site on Java, which is shaped like a mandala, inspired Kun-Yang Lin to his choreography.